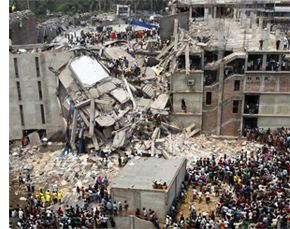 Sunday marks the third anniversary of the collapse of the Rana Plaza apparel factory building, which killed more than 1,000 workers. As I confess in my recent Huffington Post article, I love to shop. Choosing what to wear is my creative outlet. But I have also dedicated my life to fighting injustice. Given the rampant exploitation in apparel supply chains, it is not always easy to balance the two. I recently had the privilege of interviewing Andrew Morgan, director of the documentary The True Cost. If you are not familiar with the less visible human rights abuses in the apparel supply chain, this interview and his documentary provide an excellent introduction. Fortunately, some brands are providing an alternative. As more and more people join the Fashion Revolution and stand in solidarity with apparel workers and artisan producers, it is my hope that we will create more space for these fair brands to thrive while also forcing large corporations to end exploitation in their supply chains. In the mean time, it has been exciting to provide a platform for sharing ideas about how we can all play a role in transforming the apparel sector. Many of you have joined the conversation with ideas ranging from buying from fair brands to buying less to participating in direct actions to demand better policies and practices. If you have not already, I encourage you to join the conversation now. The culture of Fast Fashion comes at a high cost to apparel workers and the environment, but we can stand together to say no more exploitation and start participating in transforming policies that affect workers around the world. As we remember the victims of Rana Plaza this week, we remember that the disaster was not a natural disaster, but an outcome of the dominance of Fast Fashion. But we can trade Fast Fashion for Fair Fashion! Together we can create the just economy everyone deserves.